LipoGaine for Women (for sensitive skin/scalp) was specifically formulated to address the issue that some women are allergic to propylene glycol in the regular Lipogaine for Women and get itchy scalp. Propylene glycol was removed from this product, so people will less likely to get itchy scalp when using this version. Please be advised that very few people who are allergic to minoxidil won’t benefit by switch from the regular version to this for sensitive skin/scalp version of Lipogaine for women. Clinically proven ingredients are perfectly harnessed in this formula to offer a complete solution for maximum results with unparalleled simplicity. It is the first hair growth formula that combines the FDA approved hair regrowth stimulator (minoxidil) with Biotin, a much sought after supplement for healthy and beautiful hair, skin, and nail. With advanced liposome delivery system, Lipogaine has made it possible to compound minoxidil together with biotin, retinol, niacin, and many other vitamins, and to deliver them deeper into scalp for maximum efficacy. This elegantly optimized formulation dries fast and is super clean. For women who are allergic to any minoxidil based hair growth solutions. Some people get itchy scalp after using regular Lipogaine for Women, Rogaine, Equate, or Kirkland minoxidil hair growth solutions. Very helpful product I have been using this product for three weeks now. I love this product. 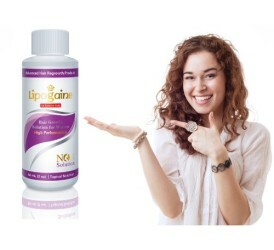 I had tried women’s Rogaine for quite a while, and noticed some improvement with the thin spots on either side ofmy head, but with Lipogaine, the difference has been very obvious. No more itch I’m happy to have a product that doesn’t cause itching. I was using Equate which is much cheaper, but it did cause an itch. It wasn’t too bad, but this is better. Also, I like the added ingredients in LipoGaine. Equate is just minoxidil and alcohol. The original LipoGaine left the roots of my hair stiff. Ths sensitive skin version doesn’t. I don’t notice a greasy texture that others reported. I will continue with this product and possibly alternate with Equate when finances are tight.